Aunt Theresa 2.0 has a smokey purple base and is packed with iridescent flakies. I used 2 coats with a top coat of Seche Vite. This polish was created to honor Tara's aunt who sadly passed away from pancreatic cancer. With each full sized bottle purchased $2 goes is donated towards The Lustgarten Foundation for Pancreatic Cancer Research. Kelara Lacquer also sells 4 other polishes, each benefiting different organizations. This polish is awesome! It's not only a unique color, it has flakies! Formula was thick, but I think that has more to do with how many flakies are packed into one bottle. :P Other than that, it dried quickly and clearly I had no problem getting out flakies. Hoodoo Man is a deep purple jelly base with green, pink and blue small matte glitters. All nails are 3 with a top coat of Seche Vite. Purple and matte glitter, yes please! Hoodoo Man is apart of Kelara's Sweet Home Chicago collection inspired by Chicago's the funky, electric blues style and funky and electric this polish is! Formula was problem free: it dried quickly and there was no need for fishing for glitter. One Man Wolf Pack is described as a gunmetal grey holographic polish. I used 2 coats with no top coat. Polka Dot Love contains bright and light pink, blue and yellow glitters in a white "crelly" base. All nails are 2 coats with a top coat of Seche Vite. Seaside is a bright blue base with holographic glitters. I used 2 coats with a top coat of HK Girl Top Coat. 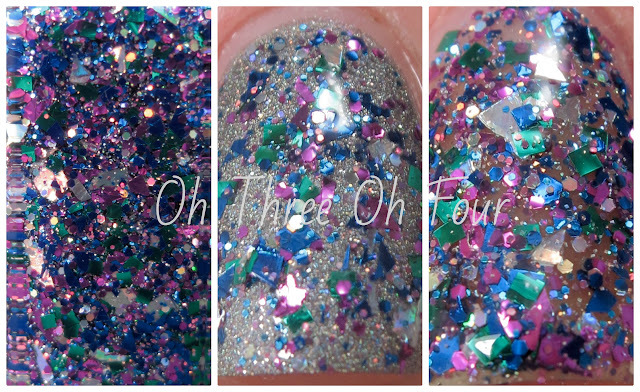 Spoonful has a clear base with various shapes and sizes of purple, blue, green, and holographic glitter. Except for my ring nail, I used 1 coat of Spoonful layered over 2 coats of One Man Wolf Pack. My ring nail is 2 coats of Spoonful over bare nail and all nails have a top coat of Seche Vite. Holy cow this polish is packed with a little bit of everything! Make sure to look at the close up below, since I can't even begin to name all the various types of glitter this polish holds. :P Formula was a bit thick, I'm pretty sure due to the fact it just has so much glitter in one bottle, and it was a little work to just lightly cover it over One Man Wolf Pack. That's ok though because it looks amazing over bare nail and builds up easily in 2 coats. Purchase Kelara Lacquers through their webstore. They currently have 6 collections in their store with many amazing colors for sale, including the ones shown. Blue Steel and Uranus look like beautiful polishes! Ok really I just wanted to say Uranus, but seriously it is an awesome looking color so check it out! ;) Find Kelara Lacquers on Facebook and Twitter.